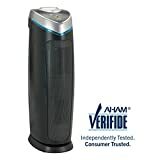 GermGuardian - AC4825 Air Purifier Review • The Air Geeks, reviews of air conditioners, dehumidifiers and air purifiers. One should not tolerate dirty and smelly air in one’s house, and GermGuardian knows this. The AC4825 is a 3-in-1 air cleaning system that was specifically designed to ensure that the air in your room is free from various contaminants, so that everyone breathes free! This system uses UV-C, HEPA, and odor reduction mechanisms to free the air that you inhale from dust, allergens, some of which causing bad smell. How does the AC4825 work? This superposition of filters (UV-C, HEPA) is highly effective filtration mechanisms that ensure that the air discharged into your house is clean and fresh. It is engineered to transform your room into a comfortable environment, for an affordable, less-than-$100, ticket. But with no further ado, let’s get technical, here, with our review! The GermGuardian AC4825 comes in a neat, 7 x 10.2 x 21.5 inches box, and as is plug-and-play as its gets : its very intuitive start is a big plus. Filter layering for better air purifying! true HEPA filtration mechanism that is ideal for capturing plant pollens, spores, pet dander, and dust mites to name a few. UV light is suitable for killing airborne viruses and bacteria. The AC4825 features a UV based mechanism that kills viruses, bacteria, and other germs. Thanks to this layers, this unit effectively eliminates rhinovirus, streptococcus, and E. coli to make the air in your room germ-free. The UV-C light destroys these disease causing microorganisms with a smart, energy-saving mechanism. Odor Reduction stands. Pets and routine house activities can be sources of odor. Unless you reduce this bad smell, it can make the environment in your room unpleasant. The AC4825 is designed to reduce bad smell from your room to create a fresh environment. This system utilizes a carbon filter to remove odor and smoke particles from your room. So, besides air purity, what else, you might ask? Well, it is always important to consider the noise level of an air purifier before purchasing it. Noisy systems can create disturbance and make your house unlivable. Thankfully, we were glad to note that its low-operation modewas designed to run quietly, which is it an ideal system for use in most parts of your house including living rooms and bedrooms. When on high, it is not unlivable, but one should better not have to work close to it. For the sake of durability, we liked the fact that the UV-C bulb and filters are replaceable parts. This air cleaner has an indicator light that alerts you to replace these parts. You don’t need to mark the replacement dates on your calendar or set a reminder in your phone. Replacing the filter and the UV-C bulb at the right time will enable the system to serve its purpose in an effective way. Systems that consume more energy than it is necessary can significantly increase your overall energy consumption. This air cleaning unit is designed to consume minimum energy and it is therefore efficient. Its impressive CADR/Watt ratio has earned it the ENERGY STAR qualification. A product qualifies for ENERGY STAR after meeting the guidelines set by EPA. Bottom line : in the long run, you pay less. This energy efficient system minds your budget and it will not cause your electricity bill to shoot in an abnormal way. A large room requires an air cleaning system that has a high suction capacity and vice versa. This 22-inch model is designed for small and medium rooms. For such rooms, this unit delivers impressive performance making your house a comfortable place with clean and fresh air. Finally, this air cleaner is compact in design and weighs 7 pounds. 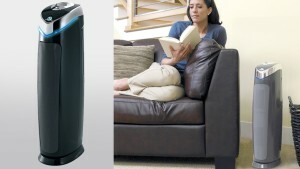 It measures 7 x 10.2 x 21.5 (inches), which can make it ideal to clean the air of small rooms, apartments or closets. Recommended Room Size 155 sq. ft. Highly effective. This unit eliminates most of the contaminants in the air. 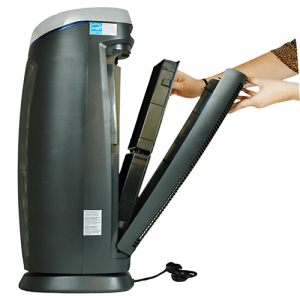 Its 3-in-1 filter design enables it to remove particles, germs, and odor from the air. Quiet operation. Although this unit produces some sound, it is tolerable and not disturbing. You can comfortably sleep with this unit running in your bedroom if you set it to low operation. Unsuitable for large rooms. This system is ideal for small rooms only. Their air cleaning effectiveness is lower when the unit is employed in relatively large rooms. Plastic smell. A good fraction of users have pointed out that the system produces an unpleasant “plastic” smell. Such users feel that a system designed to clean and freshen air should not be producing any smell. My toddler and I both have severe allergies and asthma. To the point that over the past month we have both been having major issues with the pollen and smog in the air, even with being home most of the time! I ordered this one after doing A LOT of research, and I decided this was the best for the money. With a true HEPA filter that you replace once a year (opposed to once a month) it would save money in the long run. I chose this one for the den in our house and over the coming weeks we will be getting smaller ones for the bed rooms. This review for right now is 24 hours in to having it on in the house, and later I will come back and add to it. Set up was easy straight out of the box, and I put it out of traffic areas in the house. I was worried with where I put it there would be trouble for good air circulation, but it is doing great! In fact with it on high I noticed a tag on the other side of the room (directly across) was moving on one of the toys yesterday as I was cleaning. Then I cooked fish last night (our den has an open doorway to the kitchen), and I couldnt even smell it cooking!! I decided to test it this morning, and sat on the couch painting my nails. Even using nail polish remover I couldnt smell it!!! (which astounds me b/c I hate doing my nails simple b/c of the toxic fumes!!) As far as noise, its not that bad. On high, with the tv and with kids running around it is a little white noise and thats it. I sleep with the bed room doors open, and having a tower computer on in the den annoyed me, however on medium I couldn't even hear it in the den! It also moves a lot of air b/c even when the ac isnt blowing air, it feels like it is b/c of this tower! I am super excited at the thought of having better air quality in the house so we dont have as many issues, and I know it will take probably a good month for me to be able to judge that (and trust me I keep up with our flair ups b/c my son sees a specialist so I can tell you if it will make a difference or not). I also liked the UV light, since we have kids over to play all the time it makes perfect sense to have it to. Also anyone that has lung issues, make sure to avoid any purifier that has the ion part (where you turn it on for a fresh smell) it actually causes lung problems (if you have underlying problems). Oh and check out the reviews on walmart . com for this purifier, it has hundreds of reviews and most are five star (which is one of the reasons I went with this model even though not everyone loved it on here). Check back in August and I will add an update =) "
Although I dust & vacuum fairly often, I noticed I still had issues with my asthma when spending periods of time in my room (in particular when I slept at night). I was using my inhaler much more often than usual and I couldn't understand why my symptoms seemed worse in my bedroom. I've seen advertisements for air purifiers in the past (like the ones that claimed to blow 'happy ions' in your face) & figured they were the 'snake oil' of air filtration systems. It wasn't until nursing school when I started to learn about HEPA filters for hospitals that I realized proper filtration could be a game changer for my symptoms. I did my homework while searching Amazon and came across this germguardian purifier that seemed to have great feedback. After reading reviews & confirming the integrity of customers' feedback (Fakespot.com got your back), I decided to give this filter a go. I've had this air purifier for about 5 months now and I would buy one for every room in my house if they were a little less expensive. My symptoms aren't nonexistent but they've definitely improved and that's all I could ask for! I included a picture to show just how much stuff it filters from the air. This particular filter that I've just replaced is completely coated with a thick layer of dust bunnies (and goodness knows what else) after only a few months of use. My symptoms make total sense now that I see how much stuff gets left behind when cleaning. I'm hoping to catch this purifier during a price drop one day so that I can get more for my home & maybe even one for the office I work at. In all, it helps to have a little backup to help catch all the stuff that's been missed, especially for rooms with carpeting or tons of fabric that dust likes to hide in." The GermGuardian AC4825 is a highly effective air cleaning system that is ideal for relatively small rooms. This system employs a variety of mechanisms to ensure that various types of contaminates are eliminated before they reach your nostrils. It is optimized to provide your room with clean and fresh air that is free from dust particles, fungi, mold, smoke, odor, viruses, pollen, and bacteria to mention a few. In spite of its relatively small reach and the occasional plastic smell that one can feel in the early days of its uses, we are quite satisfied with our tests and recommend it.